The following prints are available now! All were taken in St. Louis County, MO. I don't know the date - they were taken on film and I didn't keep records. I have 4x6, 5x7 and 8x10 prints - some are only available in one size. 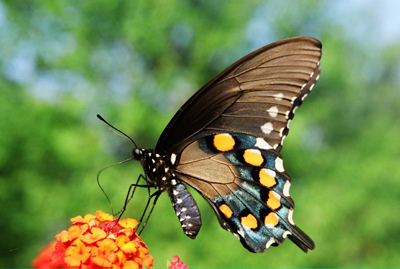 The following is a Pipevine Swallowtail butterfly. I remember this picture well. I had only rarely seen a Pipevine in my garden before this. It was nectaring on lantana growing in containers on the deck. 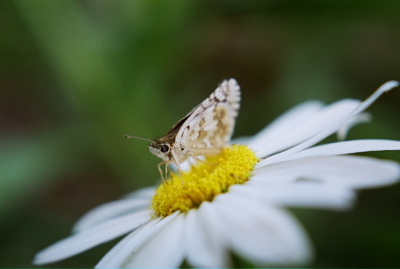 I took several pictures in the little time I had before it flew away (remember - film camera) - one of them turned out ok. This one. I'm not as into skippers as I am regular butterflies, but this sweet little guy (or girl) just sat there so nicely for me, like it knew I wanted to take its picture. I actually feel a little sad thinking about this little one, knowing its long dead now, but I'm glad I was able to capture a record of its gentle, short life. 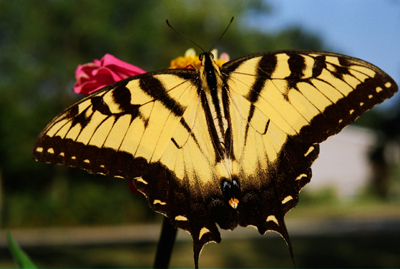 Male Tiger Swallowtail. Luck - right time, right place as far as I can remember. Black Swallowtail, resting, I believe right after emerging from its chrysalis. Probably one I raised. 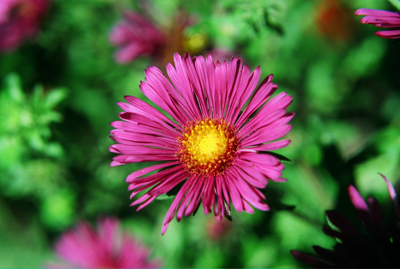 New England Aster. I'll admit I like the more purplely ones better, but this picture turned out pretty well. 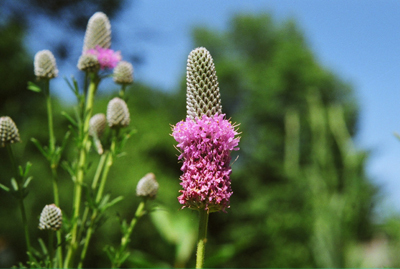 Purple Prairie Clover. One of my favorite native prairie plants. One of the few pictures I ever got of them that looks decent though. My non-slr-no macro lens-no manual focusing digital camera can't begin to take one of these in focus. Please feel free to donate to my 'Help buy Trisha a decent camera by buying her stuff' fund. 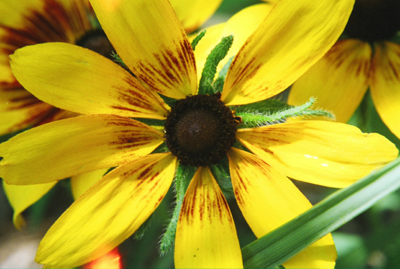 Black-eyed Susan, real close up. A common native favorite. Now the cool stuff - the caterpillars. 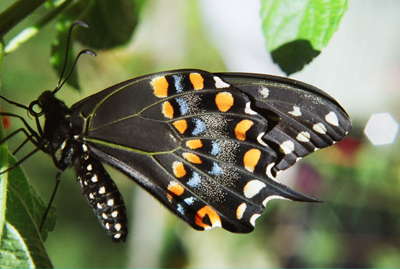 This is a Black Swallowtail that just recently molted. Notice the dead skin it just molted behind it. And its head capsule is still white. 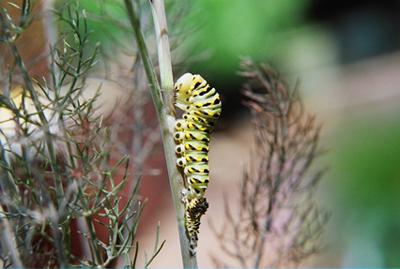 Spicebush Swallowtail caterpillar. Coolest caterpillars ever. Really. 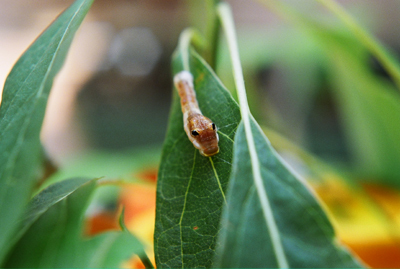 Early instar. The later ones are cooler but hard to get pictures of. They make nests by folding up leaves. So most of my pictures of them have my fingers in them, trying to hold apart the leaves while taking a picture. 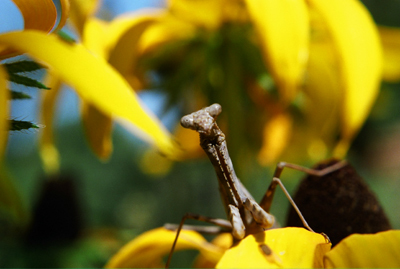 Praying mantis. What more can I say? 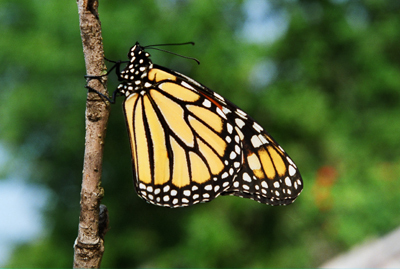 You grow native plants, you attract all kind of wildlife. Most years they are all over my garden. Never get tired of them.